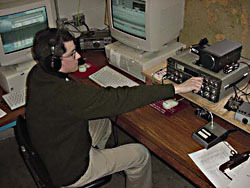 The original W5YM operating console on the 8th floor of SCEN, sometime before 2002. These photos are from the original Science and Engineering location on the 8th floor. 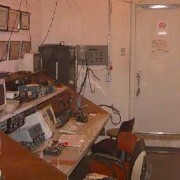 (The current W5YM shack is directly below this room on the 7th floor of SCEN. 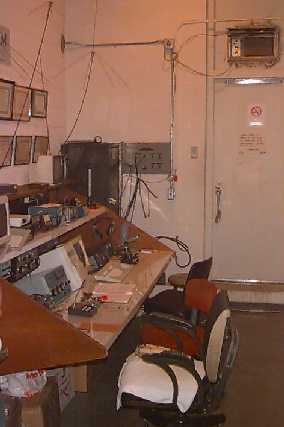 Another view of the original W5YM operating console on the 8th floor of SCEN (pre-2002). The station included HF, VHF, Packet, RTTY, and satellite capabilities. The main radio equipment was a Kenwood TS430 and a Kenwood TS790. When the Science and Engineering building underwent renovation circa 2002, W5YM was temporarily moved to quarters atop the Bell Engineering Center (BELL) until renovations were complete. A few snapshots of the Shack during this period can be seen here. W5YM 2002-2003 club president, James Webster (KD5QYG) tunes up the primary HF rig during the fall contests in the temporary Shack location in BELL. 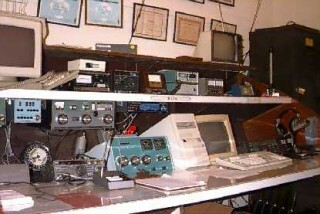 During the renovation of SCEN, the radios and other Shack equipment moved to the top floor of BELL. However, the towers and antennas remained atop SCEN, and were remotely controlled from the BELL location. 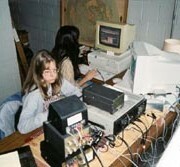 W5YM 2002-2003 vice president Rebecca Worste (KD5LJS) sits at the controls in the temporary Shack location in BELL while another member logs contacts in the background (c. 2002). 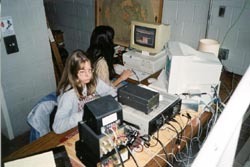 Anyone with photos of the W5YM Shack during this time period (or any other) is encouraged to share them with us so that we can include them here on the website. Please send any photos to w5ym@uark.edu or, better yet, share them on the w5ym-l listserv!